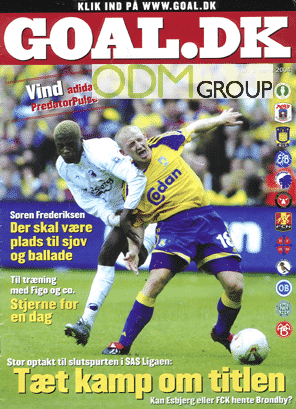 The famous Danish football magazine, Goal is using on-pack promotion as a part of their marketing strategy. This includes a free Puma bag worth $37, when you purchase 6 editions of the magazine. This free gift with purchase is ideal as a sports bag. The bag contains two large rooms with a separate zipper inner pocket. This promotion shows us that its possible for two different companies to collaborate about their marketing approaches and thereby take advantage of its different core competences. When you are deciding which product to add as a free gift with your on-pack promotions, you need to consider the identity and value of the brand you are collaborating with. You then need to ask yourself the question: Is this brand value similar to the company’s? Or does this brand even have a higher brand value? If you manage to choose the right on-pack promotion it will increase the value of your brand, because customers start to associate your brand with the one you are collaborating with. The magazine Goal is a great example of this. Puma is a well-known brand in Denmark and especially in the football-world where they are sponsoring larger events. You can hereby choose to print your specific logo on, if you have such kind of partnerships with companies like this. This will naturally increase your brand awareness together with the other brand. Why use Sports Bags as On-Pack Promotion? On pack promotions are a great marketing strategy to make something unique and memorable to your customers. It is a great way to brand your logo in collaboration with other brands, because it makes it easier for customers to remember your logo together with others. Sports bags are a common and easy thing to add as on-pack promotions. People will use the bags in public and will therefore advertise your brand for you. This will create more brand awareness and thereby boost sales in the long run. ODM Group already have a lot of experiences in designing and manufacturing on-pack promotions like sports bags. Below are some other related products you can look at for more inspiration. Goal.dk tilbyder en ekstra gratis gave, ved køb af 6 numre af deres magasiner. Dette er et unikt tilbud som skaber ekstra værdi til deres produkter. 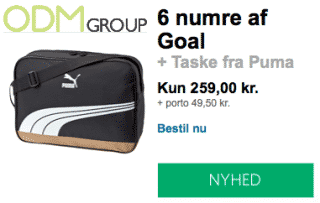 Den gratis gave består af en Puma sporttaske. Disse virksomheder har dermed indgået et unikt samarbejde omkring deres markedsføringsstrategi.